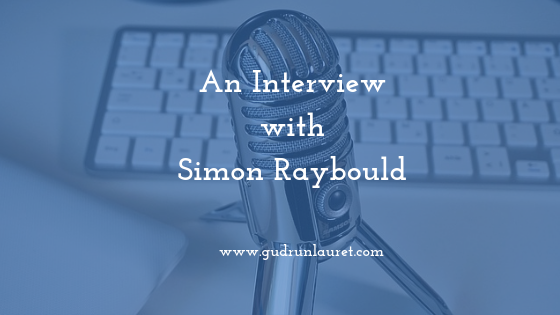 In the first in a series, I talk to Simon Raybould about his AIRProductivity podcast, why he started it and what benefits it’s brought to his business. If you’d like to read the full transcript, you can download it here (no email required), watch the video above or just listen to the audio. 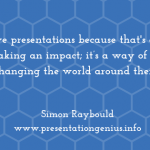 Simon is a presentation skills trainer, and helps people, particularly those who are newly-promoted, to talk about what it is that they do. He helps them stand at the front of the meeting room and sound intelligent, get the message across and do it with a lot less anxiety than most people experience. Simon hosts The AIR Productivity Podcast, which he admits he started as an experiment to see what it was like and to build more awareness of his brand. Presenting, of course, is very visual, so it doesn’t naturally lend itself to the podcast medium, but the advantage for Simon is that nobody else in the field is doing it. On the show, Simon shares tips and advice on how to be more productive and hopefully change the world. He says: “There’s a lot of research about how to be productive that never actually makes its way out into the world” and he found that a podcast was a good way to share that research with a wider audience. Although he doesn’t have specifics, Simon says that his audience are self-employed people who are under a lot of pressure, but have some say in how and when they do things. Surprisingly, his intended target audience for the show was people in middle management, but these don’t make up the majority of listeners. More than two thirds of listeners are from overseas, with a large number in America. Simon attributes this to the fact that podcasts are more popular in the States. He thinks people find him because of his reputation (Simon has been an active member of the Professional Speakers Association for a number of years), or via social media, particularly LinkedIn. What Value do the Listeners get? The main aim of the podcast is to tell people: ‘How to get more done without losing your sanity.’ The podcast provides simple tools and tricks that anyone can implement to do more and have fun at the same time. Simon says that: “In the short term, at least, anybody can just work harder and get more done. But there comes a point where you have to have to work a little bit smarter”. 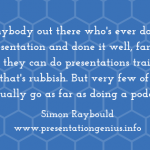 As we’ve said, presentation skills trainers don’t tend to have podcasts, and Simon says that his demonstrates two things to his audience. Firstly, it shows them his style and personality, so when they approach him, they already know what he’ll be like to work with. Secondly, it proves his credentials as both a scientist and a researcher, which is particularly useful in his industry, where many trainers provide unverified facts. By providing research-based information, listeners and clients see that he knows what he’s talking about, giving him authority and credibility. Simon says the podcast has already led to some work, despite it still being quite new (this interview was recorded in November 2018), and he’s started developing relationships which may lead to work opportunities in the future. He says: “To be honest, that’s pretty much all you can ask of social media. You get people interested, you get them to talk to you, and then it’s up to you a real person to convince them that they want to buy stuff”. 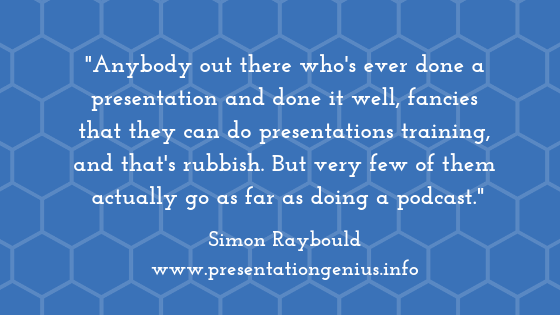 Visit Simon’s site to find out more about presentations training, or click here for productivity tips and tricks. 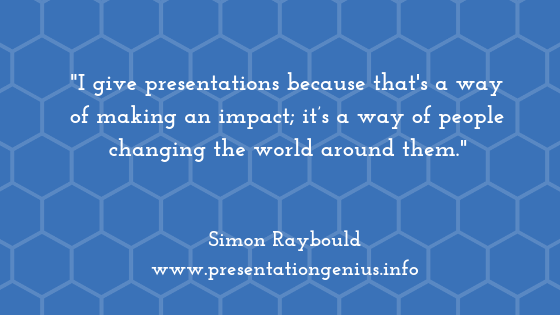 Find him on Twitter: @presentations and search for him on LinkedIn.